In the realms of connectivity, Mini-Fit and Micro-Fit terminal housings are a versatile and widely employed component. From your computer to your washing machine to your car, you’ll notice these connectors everywhere. 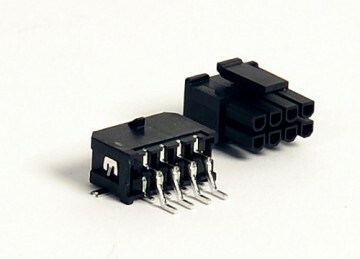 The Micro-Fit 3.0mm pitch connector is available in wire-to-wire and wire-to-board with both SMT and through-hole options, and can be found on bills of materials across diverse industries, from aerospace and defence applications through to consumer white goods, vending and even telecommunications handling currents up to 5A. From single row 2 way to 8 way dual row arrangements, each terminal has a locking tang to prevent removal from its housing and the terminal pins latch securely with their mating half to reduce the risk of unintended separation. Locating the terminal pins in the tubular housing aids the mating of plug and receptacle and isolates each terminal individually for electronic integrity. Micro-Fit terminal pins are designed to be used in non-soldered specifications, the male terminal crimping to 18 to 24 AWG cable, making it the natural choice for aerospace or automotive environments. Mini-Fit 4.2mm pitch connectors are designed to be used in higher current power applications, up to 13A, and to work with cables of 16 to 24 AWG – with the exception of the Mini-Fit Plus which crimps to 16 to 20 AWG cable. Polarised housings mean that there is no risk of mis-mating the plug and receptacle and once in place, can be secured through moulded locking arrangements. At Leotronics, connectors are our speciality. With increased warehouse capacity and economies of scale achieved through our worldwide network – sole UK distributors for CviLux components and members of the Connexcon Group – we are able to offer the very best prices on a huge range of connectors. Talk to us today to see how we can improve your supply chain and lower your manufacturing costs.